Jason's Deli Gift Card $25 Value, Only $22.00! Free Shipping! Burlington Gift Card $25 Value, Only $23.50! Free Shipping! Movietickets.com Gift Card $25 Value, Only $20.45! Free Shipping! cardcash has no other items for sale. 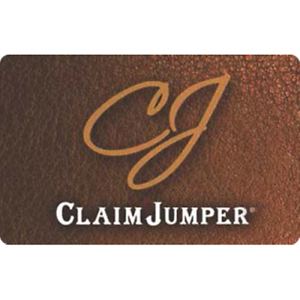 Details about Claim Jumper Gift Card $25 Value, Only $22.00! Free Shipping! Claim Jumper Gift Card $25 Value, Only $22.00! Free Shipping! Immediate payment is required upon selecting "Buy It Now" or upon checking out through the cart. We only accept payment via U.S. PayPal accounts. PayPal allows you to pay using a major credit card or direct transfer from your bank accounts. We are legally required to collect sales tax in those states and localities where we maintain a physical presence (nexus). The applicable amount of sales tax charged to an order will be calculated based on the shipment destination's state.